THE SKINNY: If you were to combine a moisturizer and a pore minimizer, you would get a product that's lightweight and creamy but thicker than your average lotion. The texture in mind was exactly what DDF Wrinkle Resist Plus Pore Minimizer delivered. Except DDF Wrinkle Resist is orange. DDF Wrinkle Resist is meant to minimize your pores, exfoliate your skin and deliver a lot of hydration to help improve the appearance of your skin over time. I really liked the way this product felt on my skin, and it blended in easily without feeling heavy or sticky. It uses amino peptides, which build proteins in the skin, to shrink pores. The only problem? It made my face break out within a day. KEEP OR TOSS: I had to toss this one. 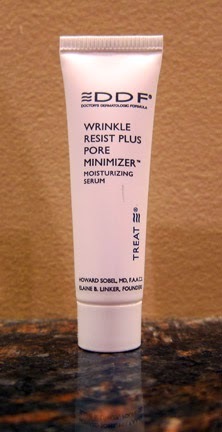 CHECK IT OUT: DDF Wrinkle Resist Plus Pore Minimizer is expensive, but you don't need a lot of product per use.